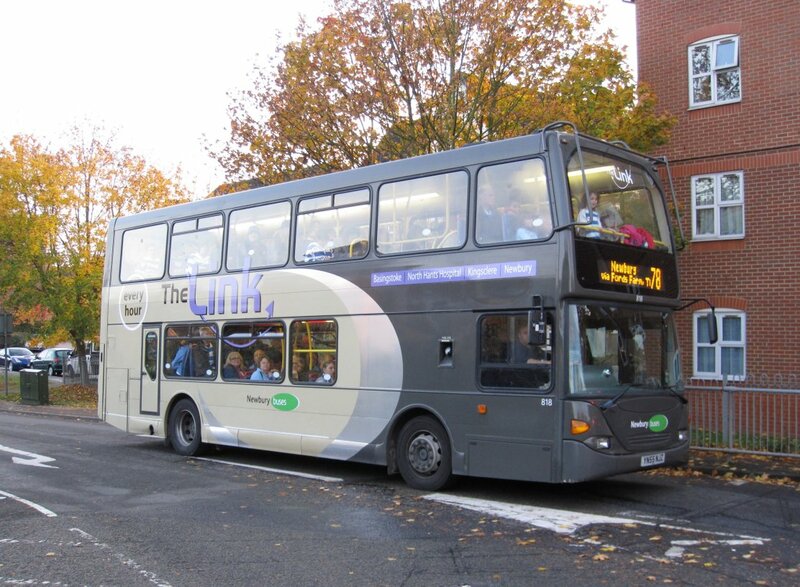 Reading Transport Fleet List: 201-6 are expected to start to arrive in a couple of weeks time, slightly earlier than expected, and go into service in early December. In preparation for this light pink Scanias 819-24 will be repainted into generic silver at the rate of one per week, ousting 722/3/4/8/9 following use on rail replacement work over the Christmas period. 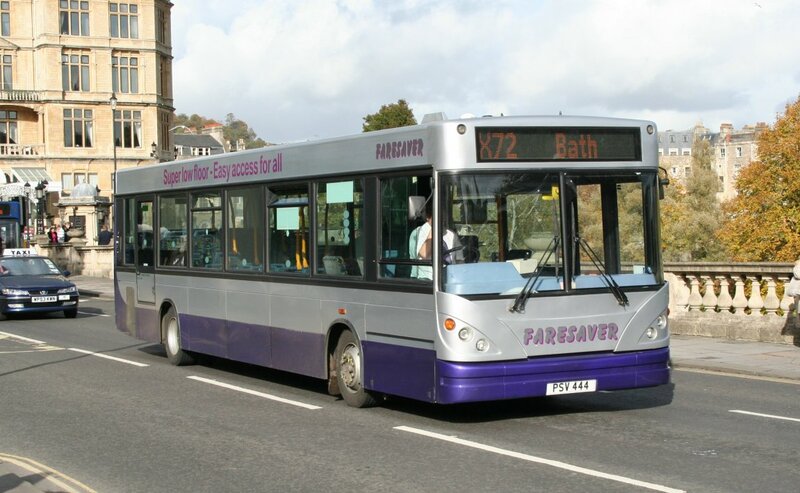 Reading Transport Dennis Dart SLFs: New photo of former 602 with Faresaver added. Thanks to David Smith for this. Stagecoach in Warwickshire Fleet List: 52526 has arrived at Rugby for Megabus work and entered service today. Thanks to Antony Shaw for this. Baileys of Newbury Fleet List: New in September was Mercedes-Benz 516CDI RV60 DLF with YX05 DJE going to EVM, Kilbeggan (dealer). Thanks to Derek Bradfield for this. Burghfield Mini Coaches Fleet List: S168 UYA was sold to a private owner in September. Thanks to Derek Bradfield for this. Courtney Coaches Fleet List: S847 DGX and S857 DGX were sold to Carr, Maghull in September. KX54 NLC/D were returned to Dawson Rentals in July, with NLC passing from there to Premiere Nottingham and NDL to Go Goodwin, Eccles in September. Thanks to Derek Bradfield for this. Reading Area Operators: Two Rivers Travel FN02 VBV has been advertised for sale in the trade press. Thanks to Derek Bradfield for this. Reading & Wokingham Coaches Fleet List: W524 ORM was sold to Redwood, Hemyock in September. Thanks to Derek Bradfield for this. Stewarts of Mortimer Fleet List: New is Alexander Dennis Enviro 200 YN60 DXK which is named Derek. YN58 FXT has been named The Rocket and YX10 BHA Linda. Two Mercedes-Benz 0816D / Plaxton Cheetahs are on order for November to replace YN55 YRY which will pass to Vale, Thruxton (dealer) and YN55 YRV which will pass to Plaxton (dealer). Thanks to Derek Bradfield for this. Weavaway Travel Fleet List: BKZ 70 and NBZ 70 have been reregistered back to their original registrations and sold to Marshall, Leighton Buzzard. Renault Trafic vans CW54/6 TOP have been reregistered RK54 DFN and RA56 GYT and are for sale. An additional Renault Master van is RY54 GHA which was reregistered V111 RGL in June. Thanks to Derek Bradfield for this. Stagecoach in Warwickshire Fleet List: 34627 has been repainted and is back in service at Nuneaton, whilst 34493 has entered service at Rugby rather than Leamington. Nuneaton 31332, 31350, 31352, 31357 and two others have been withdrawn. Thanks to Keith Wood for this. 52677 has arrived at Rugby for Megabus work. Thanks to Antony Shaw for this. Stagecoach in Oxfordshire Fleet List: Banbury 31365 has lost the remainder of its route 500 branding and gone into reserve, with reserve 31320 returning to service today. Thanks to Martin Townsend for this. 22917 and 22922 departed for their new homes on 22nd completing the transfers out following the arrival of the hybrids. Stagecoach in Warwickshire Fleet List: 34494 has transferred from Nuneaton to Leamington following repaint. 34493 is also at Leamington repainted, but not yet in service. Thanks to Keith Wood for this. 34491 has transferred from Nuneaton to Rugby following repaint. Thanks to Antony Shaw for this. Nuneaton 34492/5-7, 34625/6/8, 34641-4 have gone into reserve for repaint. Rugby 31322 and Nuneaton 31327 have been withdrawn for disposal. 17059/76 have returned to service at Leamington. Mortons Travel Fleet List: A new addition is preserved Leyland National KPA 369P, which has had Kennetbus local branding added to its NBC Poppy Red livery and will see occasional use on School, Rail Replacement and Private Charter work. YJ06 LFB is for sale to depart sometime between January and March, and is likely to be replaced by a new Bova Futura. Reading Transport Former Vehicle Fleet List: Optare Solo SR Hybrid YJ60 KCA visited Reading depot one day earlier in the week. Reading Transport Dennis Dart SLFs: Prior to acquisition 608 was sold by Cavalier to a dealer, from whom it was briefly used by E & M Horsburgh, Pumpherston near Edinburgh on short term loan. First Berkshire Fleet List: 32348 arrived at Bracknell following refurbishment on 11th and is now being prepared for service. 43834 returned from Slough to Bracknell the same day. Thanks to Mat Wooll for this. 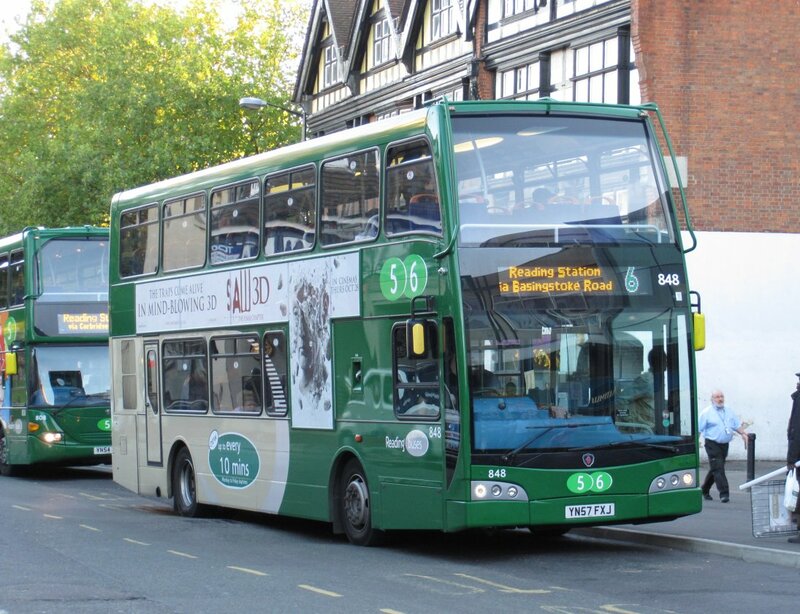 Stagecoach in Warwickshire: New photo of 36164 added. Thanks to Alistair Rigley for this. Stagecoach in Warwickshire Fleet List: 36175/6 are KX60 DUA/H. Thanks to Dave Mills for this. 34493 has arrived at Leamington from Nuneaton with recently transferred 34499 going for repaint. Thanks to Keith Wood for this. 52567 and 53028/9 have arrived at Rugby for Megabus duties. Thanks to Antony Shaw for this. Fourteen further Alexander Dennis Enviro 200s are on order for delivery before April 2011 which are anticipated to be for Rugby. Thanks to Bus & Coach Buyer magazine for this. Stagecoach in Oxfordshire Fleet List: 31362 has lost the remains of its route 500 branding, whilst 31365 remains branded. Thanks to Martin Townsend for this. 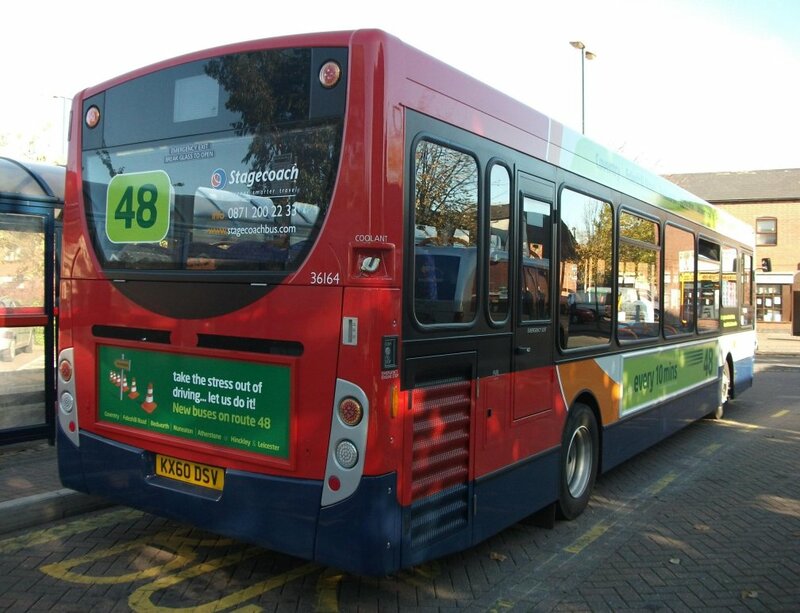 Stagecoach in Warwickshire Fleet List: 36165/9 were in service by 7th with route 48 branding. Thanks to Martin Townsend for this. First Berkshire Fleet List: 43833 went on loan from Bracknell to Slough on 1st, followed by 43834 on 13th. Thanks to Mat Wooll for this. 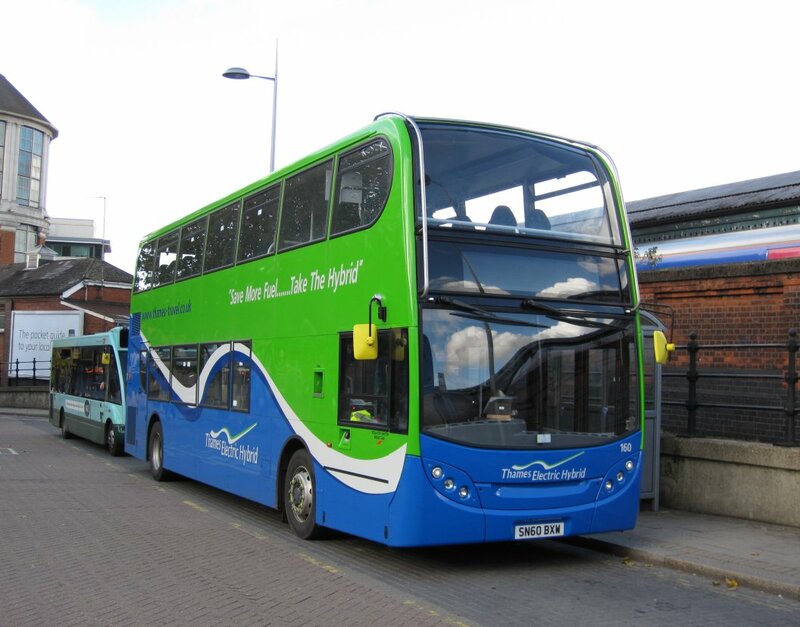 Thames Travel Fleet List: New is Alexander Dennis Enviro 400 hybrid 160 - SN60 BXW, which was in service by 7th. Thanks to Martin and Mike Stone for this. Stagecoach in Warwickshire Fleet List: 36167/8 are KX60 DTF/K and 36175/6 may also have arrived. 34499 transferred from Nuneaton to Leamington today, with 34497 and 34641-3 to follow next. Thanks to Keith Wood for this. 36153-64 all entered service on 4th. Thanks to Steve Buckley and James for this. News Page: Friar Street East Preparations for Revamped Reading Station with photos of 822, 1002, 1102 and 33143. Stagecoach in Warwickshire Fleet List: 36169 is KX60 DTN, 36173/4 KX60 DTY/Z have also arrived. Thanks to Simon for this. Stagecoach in Warwickshire Fleet List: 36172 is KX60 DTV, making 36171 KX60 DTU. 36161 and 36172 are amongst those with route 48 branding. Thanks to Daniel Mears for this. 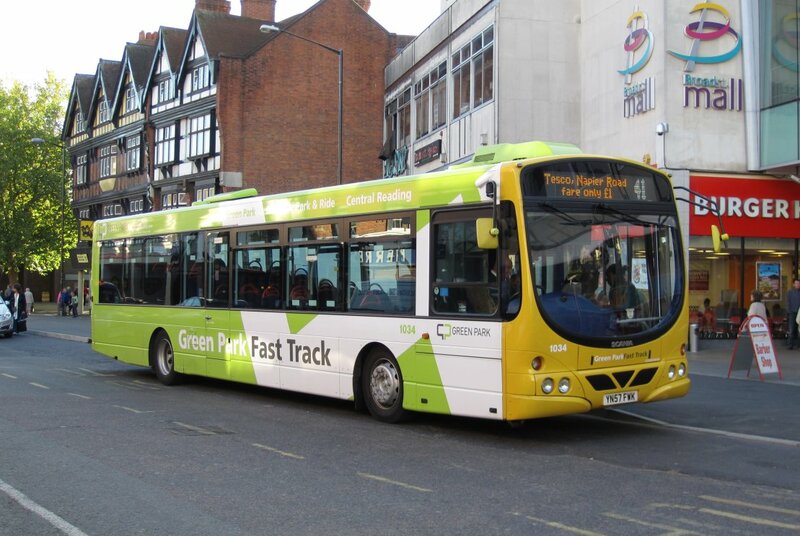 Reading Transport Fleet List: 730 has been sold to Norfolk Green. Thanks to the Anglia Bus Forum for this. Oxford Bus Company Fleet List: 110 has a new MegaRear for Ashmolian (The Pre-Raphaelites and Italy), replacing one for The Ashmolian. Thanks to Gavin Francis for this. Stagecoach in Oxfordshire Fleet List: 31361 lost its branding for route 500 a while ago. 22923/24/29/32 departed for their new homes yesterday. 33822 has changed from withdrawn to reserve status. 31320 is currently in reserve, but is to return to service shortly to replace 31361 which will be withdrawn. Stagecoach in Warwickshire Fleet List: Withdrawn Rugby 14025 and Leamington 16620 have gone on loan to Stratford to cover loans to the Ryder Cup and 16078 which has gone into reserve. 14025 also briefly saw service in Leamington, with withdrawn 14032 prepared for use as a spare vehicle. 17054/76 have been repainted into the red based livery thought to be for Unibus. 17054/55/76 have therefore transferred from Stratford to Leamington following replacement by the new Scanias. 17054 has returned to service prior to the start of term to cover for Scanias on loan to the Ryder Cup. 36170 is KX60 DTO and is branded for route 48. Thanks to Keith Wood for this.